This is Connor and Justin in 2006. We were up north on a getaway with my mom, grandma, daughter, and I. It was actually really fun. Like I said, we are a fun bunch. Looking at this picture just reminds me of how fast time flies. The baby with the pacifier is potty training and sleeps in a big boy bed. Connor is in school now. I used to think those days would never come. Now I'm hoping for them to slow down a little. 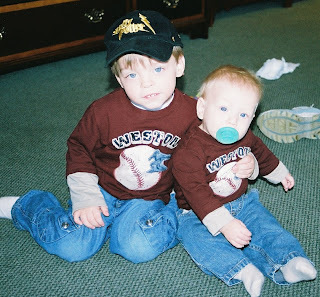 I loved those little matching shirts. Ok, your turn. My computer is acting up so I can't link, but would Amy at Insanely Blessed, Luanne at Less of Me, Shelley at Crumbs from a Full Plate, and the Blacksheep family please post their 4th picture. If you really don't want to, ok. Party pooper.